What a sight! It was on Friday September 21, 2012 at around 7pm. 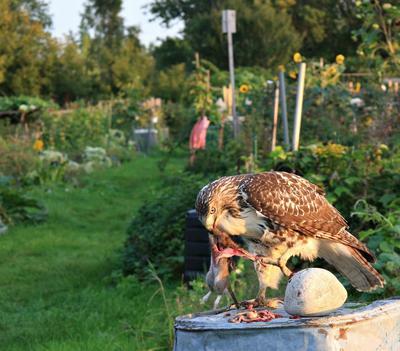 We were gardening at the Leslie Spit allotment gardens when we sighted this Hawk eating a rodent on top of the composter. We were so excited to get within 4 feet to take these photos of this magnificent bird. A mind blowing experience to say the least. Do you see how large those talons are?